As your hands warm roof terrace? Roof roof - this is one of the best waysto increase the total area of ​​your home with minimal cost. Raising such a structure, you get enough extra large room that can be a good child, or your personal study. Also, you can simply invite guests to, in general, a lot of variants to choose from. Equipping it, you need to be prepared that it is important to do everything correctly and step by step. By itself, this is a mansard roof - a converted attic, its creation requires a structural approach to the total remodeling, roofing and insulation. 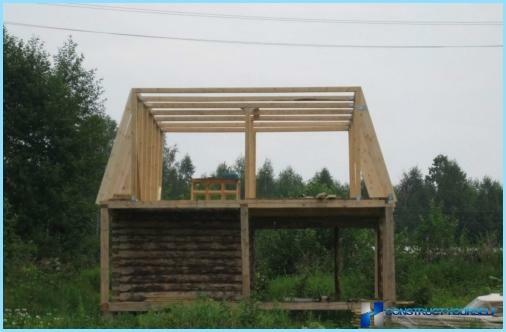 Construction of the roof loft-style country house, is not very different from the construction of a conventional roof. Below we carefully examine how their own hands properly build a mansard roof. First of all, you need to consider the advantages and disadvantages of such a roof, for that would finally decide whether to proceed with its construction. view from the window. Nice view from the window of the attic will not leave anyone indifferent, as the view of the outside world from a height - it is always nice. If you decide to engage in the construction of the atticroof, then first of all you should start with the design of how your work will look like in the end result, but also exactly how to implement his plan. Major decisions regarding the type of roof, you need to take given the design features of the house. 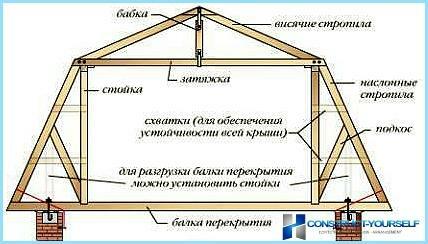 Gable roof. By itself, a simple roof with two slopes, below the actually constructed attic. Because of its simplicity, this type of roof does not provide much difficulty as in the planning and construction. Its disadvantage is that little space in the attic of ceilings which are low angle. The broken gable roof. Its main difference from the previous type, in that there are four roof surface, which are arranged at different angles. This type of roof has its own complexity in shape and construction, but these cons recouped a significant increase in space. Single-level mansard roof. 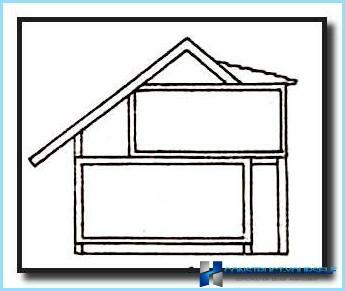 In comparison with the above, this type of roof is quite complicated in terms of construction. But, to work hard, you can get a very large room. The main difference of this roof is that, as it moves down the roof to one side of the room. The two-level roof terrace. This type of attic most difficult to construct. The project of this type of roof is being developed right along with the room because rooms are distributed on different levels of the building. The insulating layer. Between the walls of buildings and roof insulation is placed the cake of several layers, allowing you to observe the temperature regime in the whole house attic. Isolation includes sound insulation, vapor barrier, and also, a thick layer of insulation. 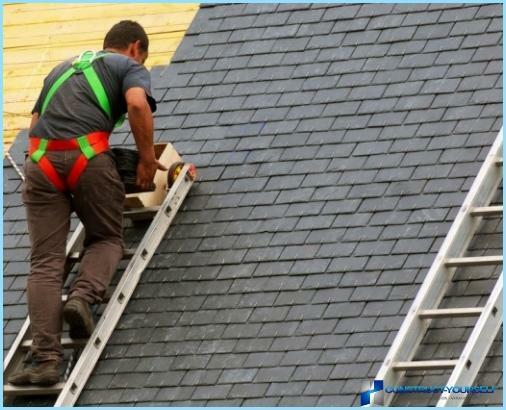 Of course the safety of most of the roof is directly dependent on proper roof insulation. The video, which will help with your job? Quite often the architects designing the roof,overlooked by significant errors in the ventilation and insulation. These errors are fraught with the fact that the roof appears mold, fungus and even she begins to flow is literally in two years. This is because that broken attic construction technology. Due to the fact that the attic strongly pressed against the wall inside the room, is very difficult to achieve a good heat exchange. 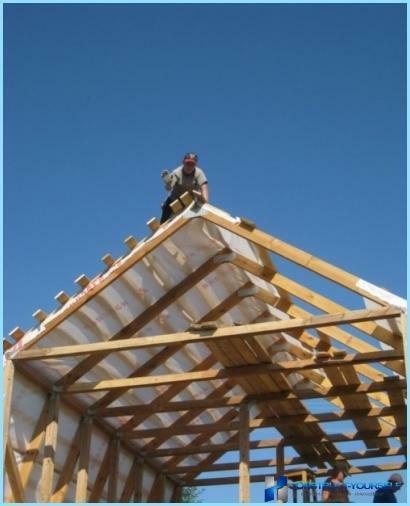 All of the attic design should include adequate ventilation, thermal insulation, as well as the truss, which will be made of wood treated with flame retardants. The thickness of the insulation should be at least 20cm,as the climate in our area in the winter cold enough and hot enough during the summer. 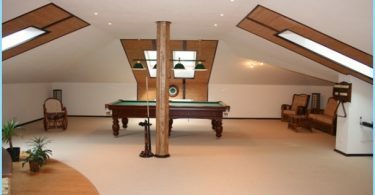 The main disadvantages of the attic design lies in the fact that in winter, a lot of heat is lost, and in the summer is very hot in the attic. Proper insulation is able to fully solve the problem, it will keep the heat inside during the winter, and will not allow a lot of heat in the intense heat in the summer. Just as you need to be buildroof ventilation. 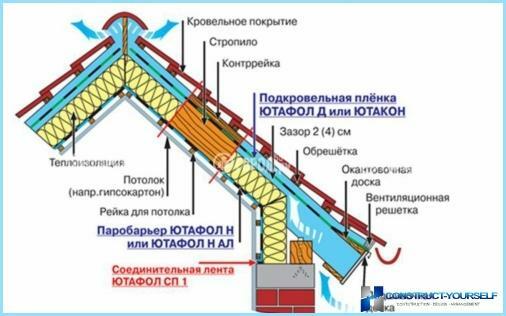 During the summer, at a sufficiently high temperature, the roof tends to be hot, this process significantly increases the temperature inside the attic. Properly laid ventilation ensures a comfortable stay in the room, as well as protect the roof from damage during the winter. Soundproofing is needed in order to reduce the noise level inside the attic, when the street is hail, rain or strong wind. Important! Perform the laying of any type of insulation is preferably paired with a person with experience in this matter. Start, of course, should be a development of thefloor. This can help you to a specialist or if your computer knowledge at an adequate level, to do everything in a special program. Then you absolutely need to calculate angles of the roof, load, etc. To do everything correctly, you need to carefully examine how such a book "Loads and effects." Tip! Correctly understand everything, you will book "Loads and effects on buildings and structures"
At this stage, we will have to work hard andfor the quality performance of the tasks you need at least 3-4 employees. 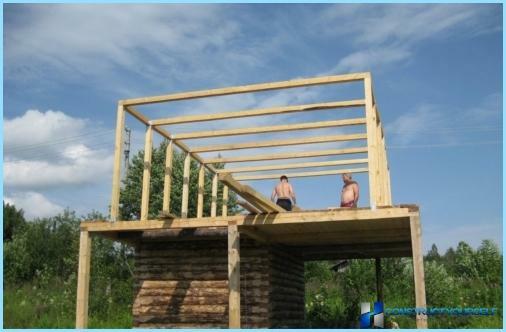 Construction of the roof begin with, stowed and secured mauerlat across the area of ​​the house. It uses a beam section 100x100 mm. This is followed by set space frame, itrack will be used as a backup for the entire truss construction. The cross sections of the beam must correspond to the cross sections of the longitudinal beams, because they will be based rack. To begin with the building of the two sides need to install the uprights. They need to fix the longitudinal beams, while using self-tapping screws and metal corners. Tip! Screwdriver will greatly facilitate the process of working on fixture. And so, we got two arches, should be betweenstretch cord, if its direction will be strictly horizontal, it will mean that all is correct, but if not, then one of the arches have somewhat shortened. Next, a necessary step for the rafters, strictly on a cord set following arch. With the help of jumpers anchoring the arch, and to secure themselves using special jumpers, pressed corners. This is followed by the installation of the upper rafters, and thisquite a difficult job. They must be set at right angles and balance, and this is the complexity of the whole. Make a template of the two boards, they must comply fully with the United rafters, which we plan to do. 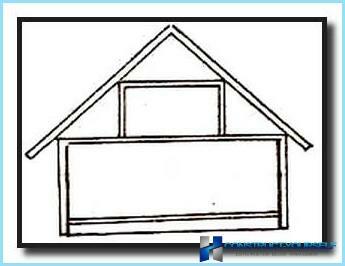 When using this template, you should cut the rafters, which are on the ground, and then put them in the right place. 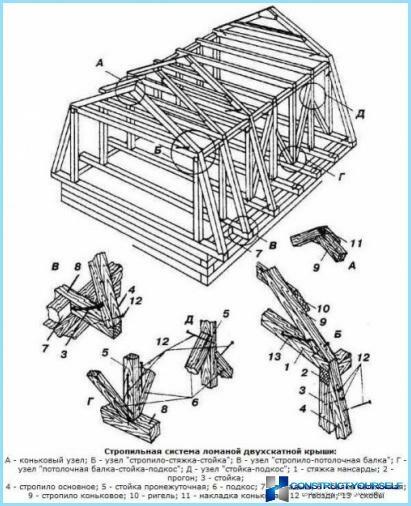 Assembling trusses occurs so as for the construction of the interior. 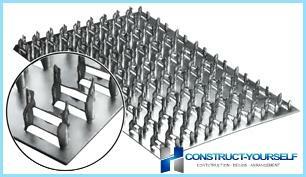 Installing truss construction ends that need to nail crate. The material from which it can be done - it is plywood, particle board or a simple board. After the installation work and cratestrusses are completed, we can proceed to the insulating layer. Vapor barrier is placed on the inner side of the roof, so we attach it stapled to the rafters. This is followed by the installation of insulation. It is necessary to watch closely to the heat insulation layer was firmly laid on the rafters surface. Slots should not be, otherwise it will lead in the future to a very negative consequences. Crate is attached to the insulation in increments of 50 cm. Waterproofing is placed outside of the rafters, its direct function: protection from moisture inside. On the surface of the waterproofing is laid roof. Attention! In the conduct of construction work should be strictly observe safety precautions. I think you have noticed that the construction of the attic quite a serious event. On how responsibly you come to work, it depends on the longevity of your creation. 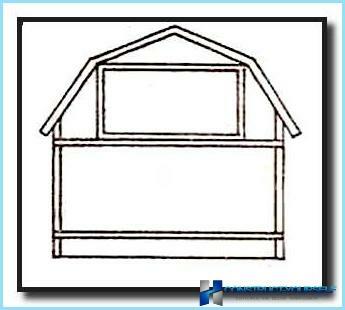 There is a considerable number of examples, how canlook mansard roof. Among its varieties, everyone can choose something different. If you need enough daylight, you can install a large window. 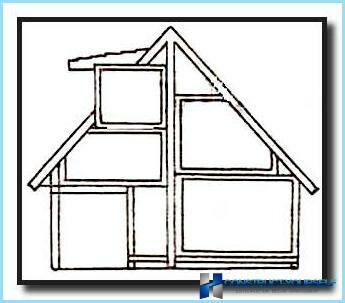 Forms attics can be rounded or strictly right angles and lines. Whatever choice you did not, the approach to this matter should be a serious and well-considered.